Earlier this year, the economy and the nation’s financial health looked like it might finally be on the mend. After bottoming out in the 6500s in March 2009, the Dow has spent the last several quarters roaring back. By April of this year, the Dow was back above 11,000, unemployment numbers were starting to come down and the housing market was starting to pick up again. Good times were back, right? Not so fast! In the last few months, the Dow has dropped back below 10,000, the unemployment rate has continued to hang around the 10% area and home sales have started to drop yet again. It’s starting to feel a little like we’re closer to the bottom than the top once again. The unemployment rate currently stands at 9.5% as of June 2010. That’s down slightly from its peak at 10.1% but it’s still a far cry from the 5.5% rate of just two years ago. That rate doesn’t even take into account people who’ve stopped looking for a job altogether so the “true” unemployment rate could very well be higher. Economic recoveries usually include job creation – especially the ones that are sustainable – so it’s difficult to surmise that we’ve climbed out of recession with so many still out of work. The housing market tells a similar story. Although we’re seeing signs that certain markets are beginning to see upticks in activity, some of the major markets like California, Florida and Las Vegas are still struggling and will take years to recover. The glut of For Sale signs that clutter neighborhoods all across the country suggests that many are still struggling to keep up with or even qualify for a home mortgage. Also consider the bond market for answers. Treasury yields are near historic lows right now. Investors are demonstrating the “flight to quality” that often exists during times of struggle and uncertainty. Mortgage rates continue to remain at all-time lows as well and the Fed continues to keep its rates near zero all in attempt to stimulate the recovery. Once these rates start slowly moving back up again will we have a better sense that a truer economic recovery is starting to take root. The numbers suggest that we haven’t recovered from the recession quite as vigorously as some would think. 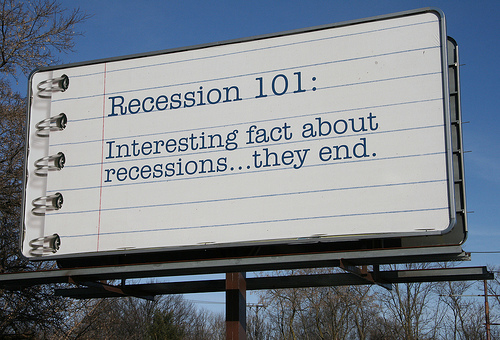 In fact, history may indeed tell us that we’ve been in recession all along. While the stock market has regained much of the ground it lost and some statistics look better than they did a year ago, we very well may still have a long ways to go.